Would Anyone Care To Listen For Just ‘One Week’? Late the other night, there was an interesting discussion among friends about rare and old films. Everyone has their favorites — many are long out of print, or just plain hard to find. Among my personal favorites is Buster Keaton’s One Week, embedded above. It paints a hilarious picture of Buster and his newlywed Sybil putting together their portable house. Now, that’s Media Art definitely worth preserving! This week’s challenge involved searching for any local, national, or international archive of audio or video worthy of recommending as a cultural resource. I’m not just talking about YouTube here — I’m suggesting that there are important new advances in high-quality compression and delivery methods that should make it much easier to preserve and archive both old films and ‘New Media’ art alike. There are four media artists featured, with accompanying digital audio and video examples and interviews. The videos are generally rendered at a very low resolution, which detracts quite a bit from the user experience. 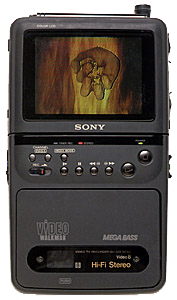 Sometimes, it’s the technology used in the original that’s to blame, as evidenced by Daniel Dion’s The Moment of Truth, which was originally presented on a portable Sony Video Walkman in 1991. Certainly it can be difficult — not to mention expensive and time-consuming — to digitize important film, video and spoken word artifacts, and then create high quality Audio and Video formats for streaming over the Internet. Digital still seems to be a dirty word in the conservation community — so here are a few new reasons why embracing digital copies, and delivering them on the web at high resolution is beginning to make a lot more sense. Meanwhile, I’d like to visualize the future, where the science fiction of Star Trek’s Holodeck becomes reality for virtual tourists, heritage junkies, and students all over the world. I don’t expect to see it in my lifetime, but I’m still hopeful that one day my children will be able to ‘beam themselves aboard’ any museum of their choice from the security of their own home, to access past history, and understand the value of the cultural experience in context of their own lives and potential contribution to society.